▶What kind of train is the Sagano Romantic train? "Sagano Romantic Train" refers to a series of wagon-style train, originally used as a small freight train to carry cargo running on tracks laid in areas where cars and standard trains couldn't operate.It's a simple freight car that chugs along at a leisurely pace.The Sagano Romantic train embodies that spirit. The train travels at an average speed of 25 km/hr.That's about the same as a slightly speedy bicycle ride.It helps passengers enjoy the beautiful scenery along the Hozugawa River.The 7.3-kilometer, 25-minute journey is the perfect venue for taking in the seasonal sights: cherry blossoms in spring, lush greens in summer, crimson foliage in fall, and the bare fields (and occasional snow) in winter. 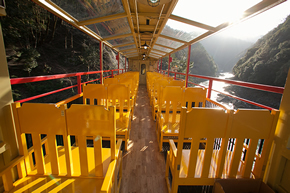 In areas of particular beauty, the train will slow down a bit to allow you to take in the sights.The beauty of this ravine is only visible to passengers on the Sagano Romantic train. You may have the opportunity to take photos that can't be snapped from anywhere else. The Sagano Sagano Romantic features classical coloring.The diesel engine pulls the train through the ravine and tugs at nostalgic heartstrings along the way. Wooden seats and bare light bulbs adorn each of the five cars in an art-deco style.The train will pull you away from modern comforts and into the extraordinary, where you can feel and hear the surrounding nature.The open-air "The Rich" (car No. 5) car has no glass windows; a ride in this car will have you feel the wind and the sun on your skin as you relax and let the nostalgic train take you away. During colder months, you'll also find trains with a coal stove installed onboard.The winter scenery is best enjoyed next to the warmth of the stove. Some of these diesel locomotive operators are women - a rare sight in Japan.They control these diesel engines (a particularly difficult type) with impeccable technological expertise and true hospitality. Passengers are sure to enjoy a safe, fun journey. Our unique onboard crew, as well as station and shop attendants, are also eager to "wow" you with their service and help create lasting travel memories. Our track maintenance staff work hard day in and day out to ensure that the trains run smoothly and safely. View photos of the beautiful scenery through all four seasons, and of the majestic trains themselves.Use the links below. 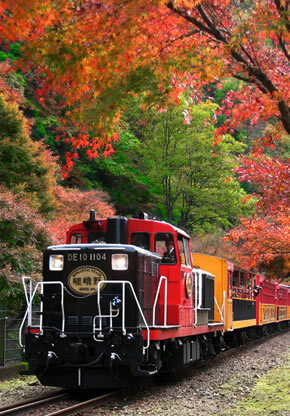 You can download a pamphlet about the Sagano Scenic Railway by clicking the button below.